These thoughts were composed on March 1, 2015 as a comment to Merritt Clifton's review of "Cowspiracy" in Animals 24-7. I share Merritt Clifton's praise for "Cowspiracy" which I watched last summer at the North American Vegetarian Society's Summerfest at the University of Pittsburgh in Johnston PA. I have just two criticisms. 2. My other criticism is that the film makes virtually no mention of the destructiveness of the poultry industry on natural environments such as the ecosystem of the Chesapeake Bay in the mid-Atlantic region of the United States, where billions of chickens are confined in thousands of filthy football-field-long buildings, and huge Tyson and Perdue chicken slaughter complexes pollute the land and water. A few years ago, the PBS show "Frontline" aired a revealing report on the ruination of the Chesapeake Bay by the chicken industry. I wish this testimony were included in the film. Excellent as "Cowspiracy" truly is, it tends to suggest that if one is concerned about the effects of animal consumption on the environment, eliminating beef from one's diet is a more significant step than eliminating poultry. This message is undesirable from every standpoint. A lovely scene in "Cowspiracy" is where, after the sickening duck-killing episode, the filmmaker is shown driving his pickup with a rescued brown hen sitting companionably next to him in the passenger seat. The film weaves beautifully together the message of animal rights, and animals themselves, with the environmental message. Some environmentalists going back to the 1970s have taken an attitude of blaming the agribusiness-owned chickens and cows for despoiling the environment, as if these poor souls were not the core victims of the industries they are trapped in and tortured by. "Cowspiracy" makes clear that there is one culprit and one solution, and it is us – our attitude and behavior as a species must change. 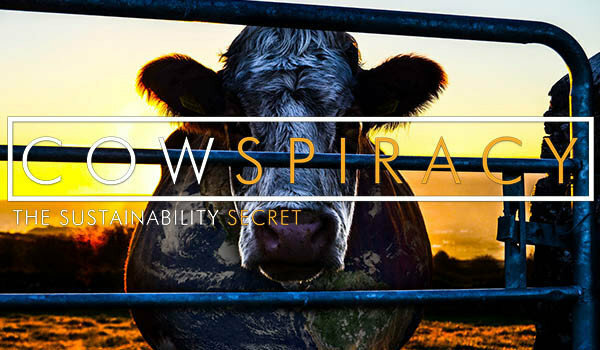 "Cowspiracy" enjoins the ethical and practical imperative of being vegan.